There are infinite ways to use texture to make spaces inviting, interesting and unique. Choosing the right ones will add dimension to a room and provide a strong element of contrast. It can make furniture pop with personality and complement existing design elements. In fabric, textures can take the form of patterns woven, printed or sewn onto the material or three-dimensional shapes such as tufts, pleats, shag and buttons. However, textures aren't limited to just fabric and can come in the form of paintings, embossed wallpaper and wall treatments. The surfaces of carved wooden chairs, grainy cobblestone fireplaces and woven rugs add their own unique stamp to the room's decor. Texture of furniture, such as the smooth, metallic finish of a modern dining table, is just as important as the type of upholstery on a couch or depth of shag on a rug. 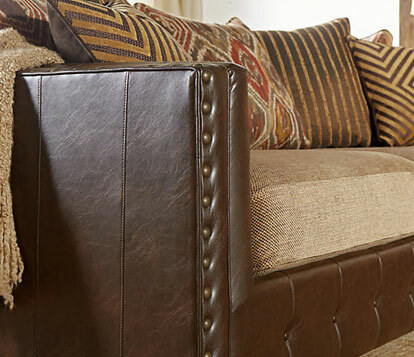 The sleek surfaces characteristic of wooden and steel furniture look great paired with leather upholstery, and can also be used to contrast rug materials with larger pile heights. Keep in mind that too much of anything can be bad. Overemphasizing texture can make a room very loud, dampening relaxation potential and creating unease. It should be used sparingly, as a spice and not the main ingredient. For example, couches with subtle quilted designs can be a pleasant way to offset neutral-colored curtains and lampshades. Even though overdoing textures is generally a no-no, concentrating them in important areas of a room will help direct attention. Fluffy trim on couch pillows combined with tufted sofa upholstery is inviting, giving friends and family members a comfortable area to socialize, laugh and watch movies. A dark leather couch next to a rich, wooden bookshelf, combined with a deep maple desk and metallic lamps make for an intimate study area. When designing an interior space, use texture to create ambiance. To create a masculine feel, consider smooth woods and rich, dark veneers, along with contemporary tables made from metal and glass. These living quarters often feature silken upholstery with neutral colors and darker hues, as well. In a more feminine space, shaggy pillow trim, furniture embellishments and soft or bright colors will be common. They also can have lots of floral patterns and tufted couch textures. Smooth surfaces pair well with vibrant, strong pigments like red, orange and marine blue. More detailed textures are best when used in combination with less intense, neutral hues such as cream, black or navy blue. It's important to balance color and texture in a way that isn't overbearing, yet gives a cohesive look and feel to the room. 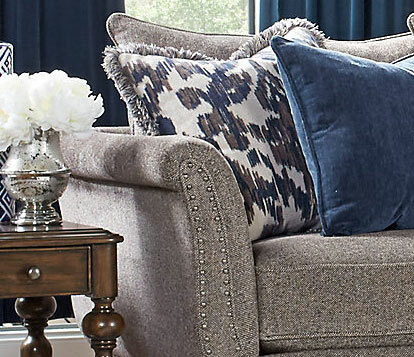 When deciding on what types of fabric to use, determine the room's focal point. If it's a smooth piece of furniture, such as an entertainment center, try patterned wallpaper or sofas with textured fabric to offset the look. If there's a wicker table or some other textured piece in the center of the room, neutral carpet, rugs and chairs may be the way to go. Depending on the types of textures used, a range of moods can be achieved. Shag rugs combined with glossy surfaces, metallic furniture and low-key fabrics will give a modern feel to a room, popular in trendy, metropolitan areas. Layered rugs, weathered woods and woven wools will help to achieve a more rustic, traditional style, often seen in southern homes and rural locations. The use of matching textures gives a sense of unity and cohesion, while contrasting ones can make design elements jump out in a subtle yet effective manner. Clustering opposite materials in a close area can create interest and grab attention. For example, a shaggy rug under a sleek metal coffee table can provide a nice balance between the two styles. When it comes to texture in interior design, homeowners can use a range of techniques to dictate the room's atmosphere. Some use brick walls, exposed concrete and visible plumbing combined with smooth couch upholstery to give their rooms an industrial, almost steam punk temperament. Other, more traditional individuals may prefer to use soft woods and fluffy fabrics to instill a sense of comfort and hominess into their space.